This content is sponsored by French’s® for the #RealFlavorsHaveCrunch program. As always, all opinions are my own. This easy Cauliflower Cheese Casserole Recipe with French’s® Crispy Jalapeños, made with fresh cauliflower and Monterey Jack cheese and topped with crunchy fried jalapeños, is a perfect addition to your holiday menu or any time of the year. The holiday season is upon us and I don’t know about you, but we’re already planning menus for family gatherings and parties with friends. While our standard favorites will certainly make an appearance, adding one or two new dishes is always fun. 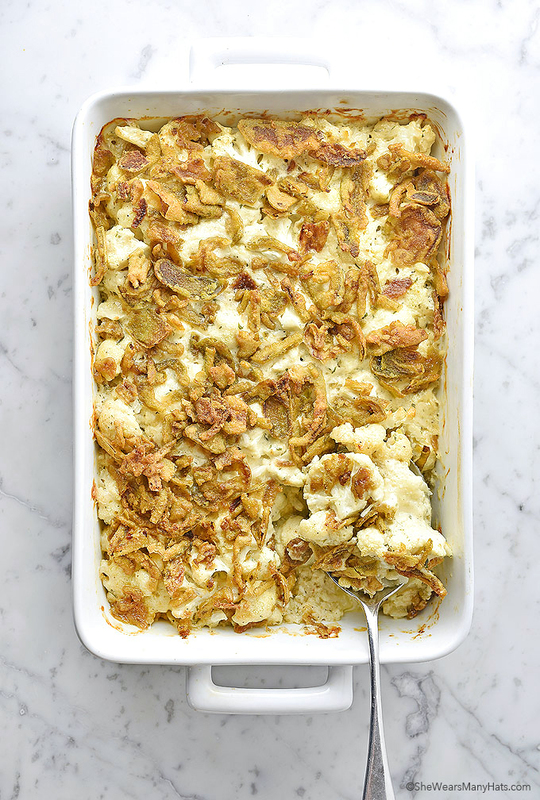 I’ve been testing this scrumptious Cauliflower Cheese Casserole Recipe topped with French’s® Crispy Jalapeños, and boy is it a winner. 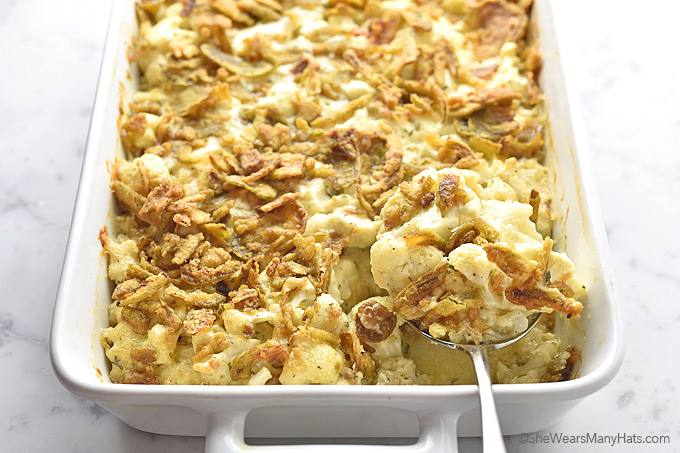 Cauliflower, creamy Monterey Jack cheese and French’s® Crispy Jalapeños combine to make a side dish that will become a regular on any holiday table. 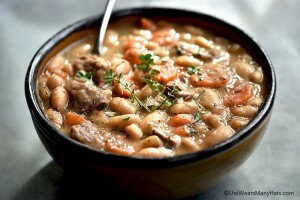 Although it’s a perfect partner for steak, pork, or chicken any time of the year. 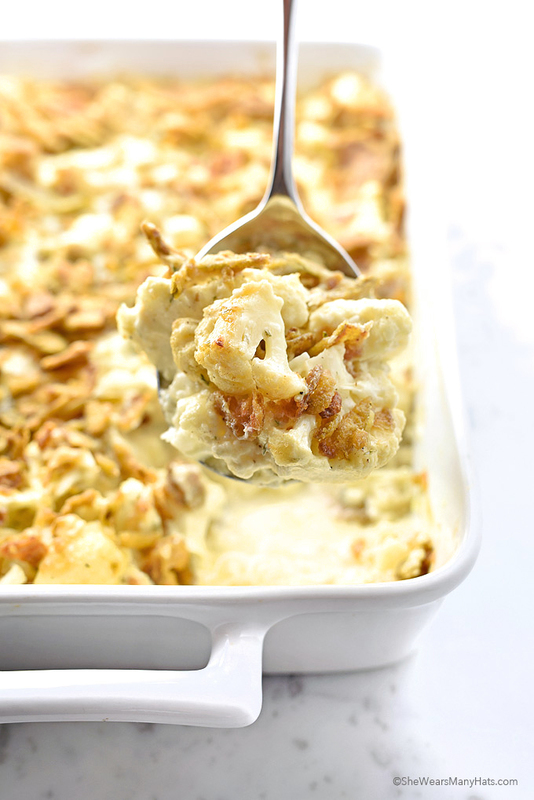 This Cauliflower Cheese Casserole Recipe is easy to prepare. 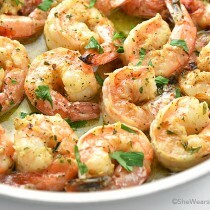 It can be made a day or two ahead of time, which makes it perfect for entertaining. Any prep that can be done before the big day is a good thing in my holiday play book. Begin by steaming or blanching the cauliflower. If you like your veggie a bit more firm, you can skip that step. I like that this casserole skips the canned cream soup as a base for a homemade base made with a roux, chicken broth and milk. While steaming the cauliflower, make a quick roux of butter and flour. 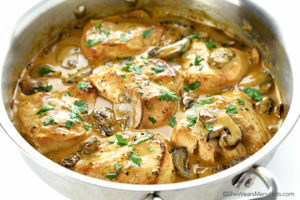 Once the roux cooks for a couple of minutes, whisk in the chicken broth, milk, parsley flakes, dried oregano, garlic powder, salt and pepper. Stir and simmer for a couple of minutes. The mixture will thicken. Remove it from the heat. Beat together an egg and mayonnaise, then slowly whisk in the thickened roux/broth mixture. Stir in the cheese, then the cauliflower and diced onion. 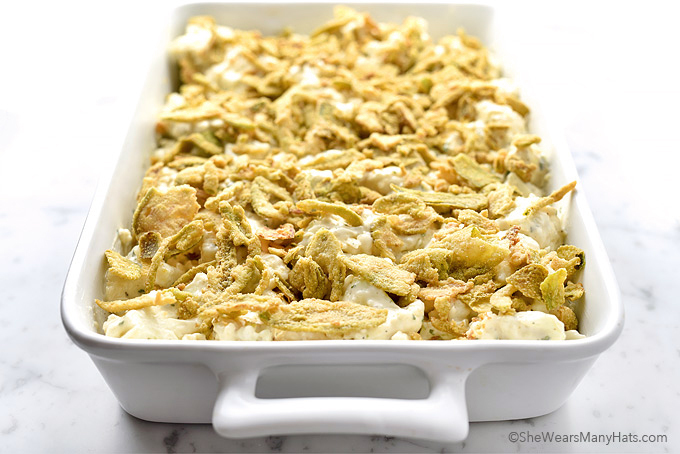 Spread into a buttered baking dish and top with French’s® Crispy Jalapeños. French’s® Crispy Jalapeños, made with real jalapeños, add a nice crunch and a good bit of spice to otherwise bland cauliflower. 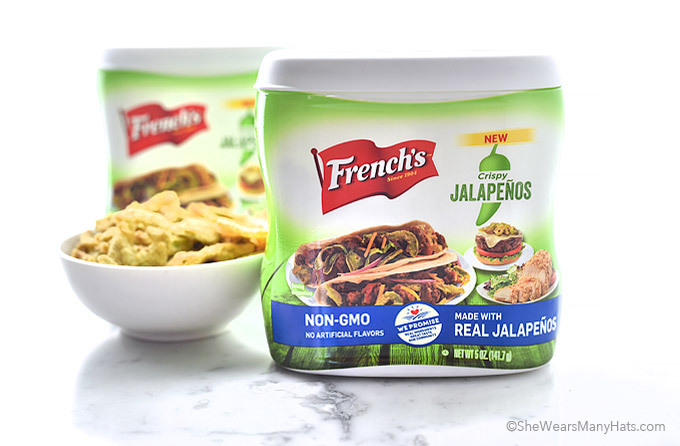 If you’ve never used French’s® Crispy Jalapeños, they are the spicy sister of the famously flavorful French’s® Fried Onions that we have all grown to love. 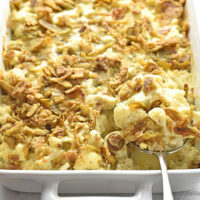 French’s® Crispy Jalapeños are a great topping for so many dishes like tacos, soups, omelets, cheese balls, mashed potatoes, potato skins, casseroles like Crispy Jalapenos Hash Brown Casserole, and, of course, this Cauliflower Cheese Casserole. 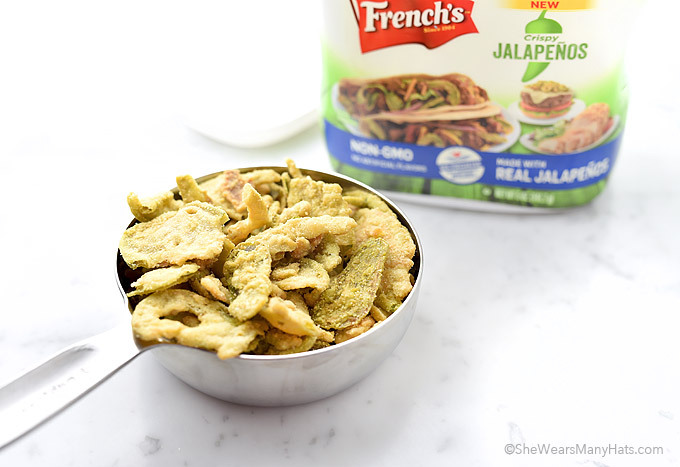 So if you like to spice things up while adding a little crunch to your favorite dishes look for French’s® Crispy Jalapeños at your local grocer. They should be right next to those French’s® Fried Onions you’ll need for that green bean casserole. Happy cooking! This easy casserole is made with fresh cauliflower and Monterey Jack cheese then topped with crunchy fried jalapeños. 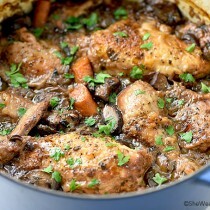 It's perfect for any holiday menu or any time of the year. 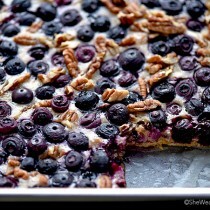 Preheat oven to 375-degrees F. Prepare 9x13-inch baking dish by lightly buttering or lightly coating with cooking spray. 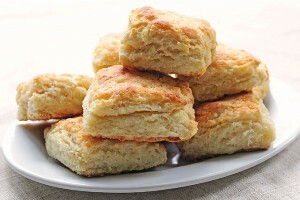 Steam or blanch cauliflower florets for 5-7 minutes. ** Drain. While cauliflower is steaming, melt butter in a small sauce pan over medium-low heat. Whisk in flour; continue to cook, stirring for 1 minute. Whisk in chicken broth, milk, parsley, oregano, garlic powder, salt and pepper. Continue to whisk until slightly thickened. Bring to a simmer. Simmer for 1-2 minutes stirring occasionally. Remove from heat. In a large mixing bowl, lightly beat egg, then whisk in the mayonnaise. Slowly whisk the warm flour/broth mixture into the egg mixture. Stir in shredded cheese and chopped onion. Add cauliflower florets; stir to fully incorporate. Evenly spread mixture in prepared baking dish. Top with French's® Crispy Jalapeños. Bake for 30 minutes at 375-degrees F. Tent with aluminum foil as needed to avoid burning top, and bake for another 15 minutes, until golden and bubbly. *This is spicy dish. If needed, French's® Crispy Fried Onions may be substituted. **If you like your veggies more firm (aka “al dente”) skip the steaming. This post was brought to you by the makers of French’s®. 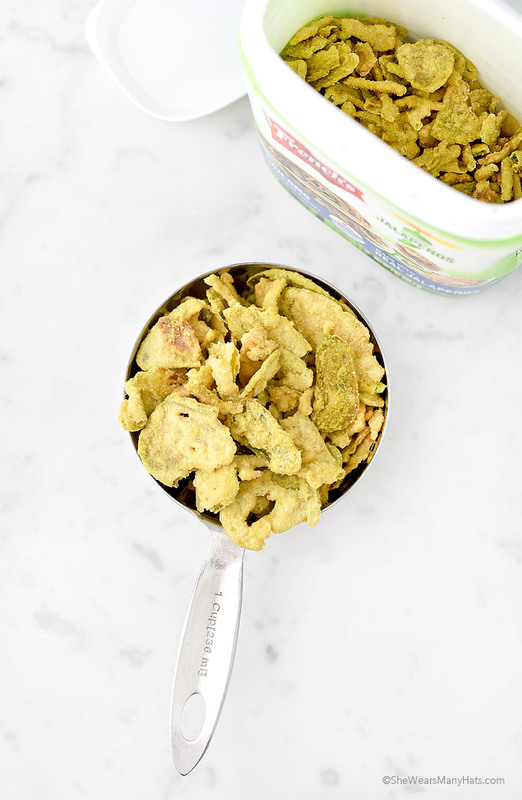 I received compensation to write this post through the #RealFlavorsHaveCrunch program. All opinions expressed are my own.